Asthma, a chronic inflammatory condition characterized by the swelling and narrowing of the airways towards the lungs, affects approximately 24 million adults and children in the US (as of 2017). It is a response to specific triggers, causing individuals to experience symptoms such as coughing, wheezing, chest tightness, and shortness of breath. Triggers vary per person, but are commonly set off by allergens, sub-optimal air quality, and exercise. For those with severe asthma, it is imperative to track and log in experiences to predict the status of their condition. Thankfully, the healthcare industry is working with new technology in developing affordable and easily accessible devices to aid users, most of which come in the form of a wearable device with a compatible application to track necessary metrics. 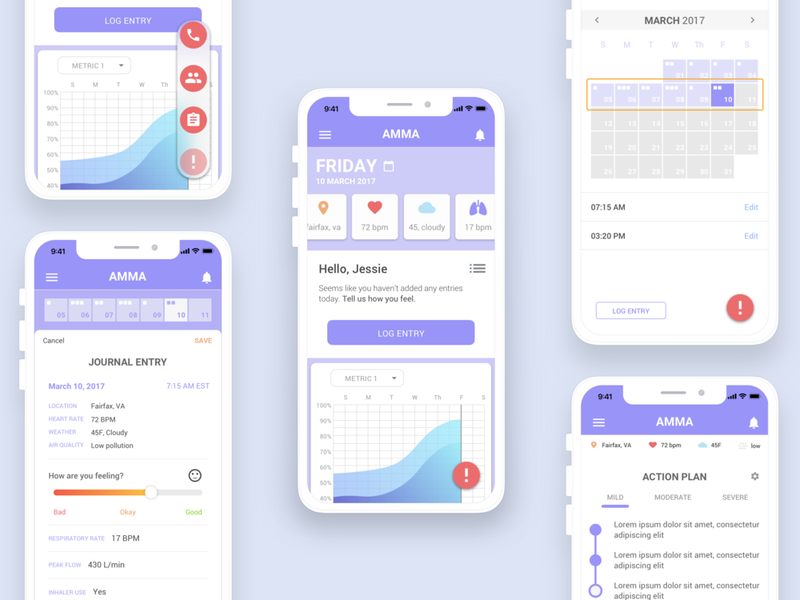 The focus of this case study is on designing a mobile application for a product called 'AMMA' or Asthma Monitoring and Management App. The app - combined with its wearable device - serves as the ultimate companion to asthmatic users. GHI has already developed the appropriate technology, but requires human-centered design to fully meet the wants and needs of wearers. to aid those inflicted with chronic asthma through prevention and swift action. The product is centered on prevention by monitoring and providing the user necessary information in keeping their health in check and asthma attacks at bay, but in cases of emergency the app also serves as an aid in seeking prompt medical attention. This should allow users to feel secure throughout their daily activities, providing them a greater sense of freedom and independence as they can be more mindful of their condition's progress. Ultimately, this app should help reduce hospitalization visits and mortality rates. My process began with preliminary background research and several one-on-one interviews. I looked for individuals with severe conditions--those most likely in need of tracking their symptoms. In addition, I interviewed caretakers and a practicing internist to help shape the priorities of the product's design. Looking at the current top competitors in the market and forming a comparative analysis, I planned out a strategy blueprint in approaching the ideation process. With the information I had gathered, I formulated the following site map. Fill out an entry for March 10th. You are experiencing a severe asthma attack. What do you do? I continued to iterate the model based on the feedback I received from tests. I was inspired by the expansiveness of the sky and its gradients, ultimately deciding on a purple-blue variant. I didn’t want the UI to seem too clinical as most medical apps appear cold, stiff, and outdated. 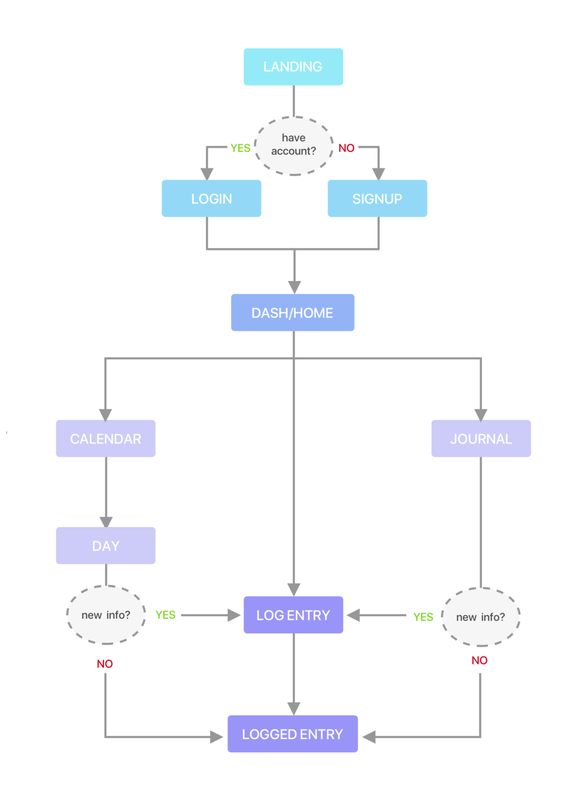 This being an application that should encourage a user to log in daily, I wanted a more modernized UI that is simple and engaging since users are more likely to keep up with an app featuring gamified interactions.